Liberation Tigers of Tamil Eelam (LTTE) Political Head S. P. Thamilchelvan accused Colombo for being the "aggressor" despite the International Community's efforts and the LTTE leadership's assurances in ceasing violence to create conducive environment for talks. Colombo has denied access to truce monitors to the Northern Front where Sri Lanka Army (SLA) has been seen readying for a frontal assault, he told TamilNet after meeting the Norwegian Ambassador Hans Brattskar in Kilinochchi Tuesday. "To pass a clear judgement on who the aggressor is, you need equal access to the forward defence localities on both sides. We have provided such access to the SLMM but Colombo has continued to refuse that access to the truce monitors," Mr. Thamilchelvan charged. The Norwegian Ambassador's visit to Kilinochchi comes after a meeting between Co-Chair's ambassadors with the Sri Lankan President Mahinda Rajapakse where Mr. Rajapakse has told the Co-Chairs that Colombo would engage in retaliation if attacked by the Tigers. LTTE Political Head said it was only SLMM, capable of defining and passing a judgement on who is engaging in aggression. 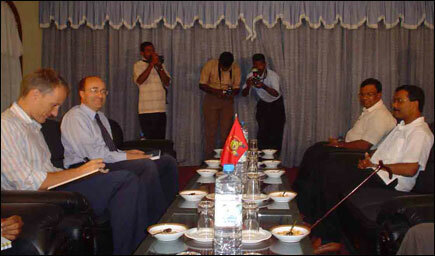 Talking to TamilNet after the meeting with the Norwegian Ambassador, the LTTE Political Head said Colombo's attempt to explain all military acts as "defensive" and "retaliatory" acts in response to violence "instigated" by the Tigers was unacceptable. "The presence and access of the SLMM to forward defence localities, to be able to judge who is the aggressor is therefore vital at this stage," he said. "Technically speaking, there is only an aggressor and a defender at a specific period of time at a specific forward defence line. The SLMM access to established forward defence localities from both sides is therefore vital, to be able to pass the judgement," he said. "We view it as a responsibility on the part of the International Community to ensure that SLMM is provided such equal access to demarcated front lines, in order to pass judgement in advance on which party is instigating violence or engaging in aggression at specific localities," Mr. Thamilchelvan said. "We have therefore told the Norwegian Ambassador that a clear stand has to be taken by the International Community at this stage." "It will be too late, to pass a final ruling on ceasefire violation after a major aggression has taken place and the entire island is plunged into a full scale war," he said. "Colombo launched an offensive last week into LTTE territory. They tried to cover it up as a clash between the Tigers and a paramilitary group. but when our forces defeated the Sri Lankan offensive, captured a soldier alive inside our territory, let him talk to the SLMM and handed over the dead bodies of 11 Sri Lankan troopers, including the major who was responsible for the operation, Colombo was exposed as the violator of the truce," Thamilchelvan added. "We are ready for talks, and agreed to the venue and date." "However, if the military aggression continued, we will be forced to reconsider the decision," LTTE political head said. The Norwegian Ambassador discussed with the Tigers at the LTTE Political Headquarters from 11:45 a.m. till 1:30 p.m.
Head of Tamileelam Police B. Nadesan, Director of LTTE's Peace Secretariat S. Puleedevan, Military Spokesman Irasiah Ilanthirayan accompanied LTTE Political Head to the meeting with the Norwegian Ambssador.